How Do You Feel About Your Fashion Style? I never ever EVER post about fashion, but I've decided to give it a try because I love clothes and find that my fashion sense is only a stone's throw from my decorating style. I think the older you get, the more you see the red thread that runs through everything that you do and how your choices are tied together somehow, without any thought in advance. I just look at a dress and either like it instantly, or I don't. And then I get it home and realize that it coordinates somehow with my interior style and I bask in the afterglow of feeling like my sense of style has finally come full circle and everything sorta works at last. Something I admired in others, their innate fashion sense, is a part of my life now too and it's a peaceful feeling because it simply happened over time and as a result of being more aware of my personal style than ever before. Personal style is always evolving, true... But let's face it, once you pass the teen years you most likely don't swing from goth to geek, from preppy to punk. Our style may evolve, but the extreme swings seem to be left behind in our youth when all we wanted was to find out who we were and what we stood for. Once you've accepted the aging process, you notice that it's actually a beautiful thing the moment you can concentrate less on finding yourself and more on finding the things you like and the people you want in your life - all the things that will fit into your "world". The quest for self feels less hurried because you have a better sense of who you are which allows you to focus more on selecting what fits into your bubble. As personal style, home style, etc. evolves - and hopefully - gets better and better, you feel so good in your own skin. This process is different for everyone, may happen sooner or later (or never), but when it does happen (and can happen at any age), you feel so good knowing you are who you are and that truth is total freedom. It's a defining moment really - when you look in your closet, in the mirror and at your home and the people in your life and say, "Yeah, these things all work nicely together". My husband and I have a lot of deep conversations. Sometimes they go a bit too deep for me, as he is an intellectual and I'm more of a dreamer, but I still am quite interested in all he has to say because often he'll just say something that makes me go, "Wow." Recently when we were speaking about all of the many types of people in the world, he said that although we all share the same planet, we each live in our own world. It's true, isn't it? I live in the Holly bubble, it's a place I've lived in since I can remember, it's where everything is good and positive and at peace. I think we all have our bubbles or worlds, don't you think? And we tend to congregate with those who share our world views because then our bubbles don't burst. I'm much more comfortable in a room filled with sweet bloggers who are really passionate about their work vs. those die hard types who view blogging as big business and want to milk all they can out of it at any price. Same with clothes and style and home sense. It's all about how we want our bubbles, our worlds, to look to us. I often thought as a young girl that fitting in was really important to succeed. As I grew older, I realized that standing out matters and often those who stand out never fit in. And as more years roll by, I see that none of it matters - you just have to be comfortable in your skin and have great passion for what you do, a measure of talent and the ability to see things through. People are naturally attracted to that. You have to have your own world and be happy in that world and not make excuses for it or pretend to be something you're not. Same is true of fashion and how you dress. Unapologetic. Free. Strong. Confident. 1| Lauren Moffatt backspin pintuck top, Steven Alan, $199. 2| Floral swing skirt, Anthropologie, €40. 3| Diae anchor blouse, Malene Birger, $197. 4| Natalini floral dress, Malene Birger, $397. 5| Bat t-shirt, Zoe Karssen, €60. 6| Darling sweater, J.Crew, €343. 1| Blog A lot shirt, Raygun, $20. 2| Stone mix necklace, J.Crew, $165. 3| Schoolboy blazer, J.Crew, €131 4| Paige Skyline Ankle Jeans, Anthropologie, €244. I've pulled together a hand full of my favorite separates for summer at the moment. As you can see, like my interiors, my fashion is eclectic, playful, happy and soft. You can find all of the clothing linked under the images and many more gorgeous outfit ideas over on my ladies clothing pinboard. So ladies, I have some questions for you. How do you feel about your fashion sense? Do you feel like you dress similarly to how you decorate your home? Do you feel like you have a defined sense of style? How did you find your sense of style? Has your style changed much since high school or college? 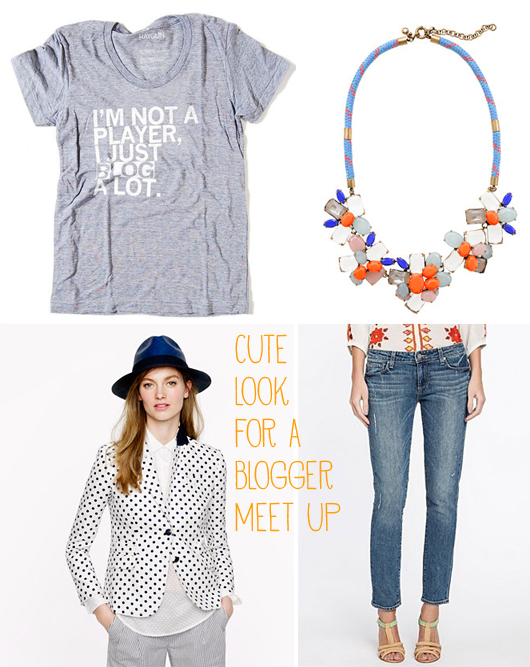 When you go to blogger meet ups (or out with the girls) do you feel good about your fashion sense?